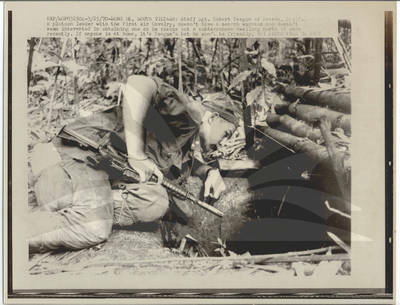 Song Be, South Vietnam: Staff Sgt. Robert Teague of Reseda, Calif., a platoon leader with the First Air Cavalry, doesn't have a search warrant and doesn't seem interested in obtaining one as he checks out a subterranean dwelling north of here recently. If anyone is at home, it's Teague's bet he won't be friendly. BW Photograph, 8.5" x 11"